Community Buzz: Dermatologist becomes a V.P., Cemetery tour and Have any old costumes? Alexandra Budnick and Ryan Benevento show off some of the outfits donated to their nonprofit, Community Costumes, which gives costumes to families in need. What do you do with your Halloween costumes? Dance costumes? Dress-up costumes? Why not donate them? Community Costumes, a charitable organization, was founded in 2014 by two New Canaan teens, Alexandra Budnick and Ryan Benevento. Since its inception, Community Costumes has collected and donated over 600 costumes to families in need. Community Costumes volunteers collect new and used Halloween, dress-up and dance costumes, and organize, label them by size and donate them to organizations supporting families in need across the tri-state area. 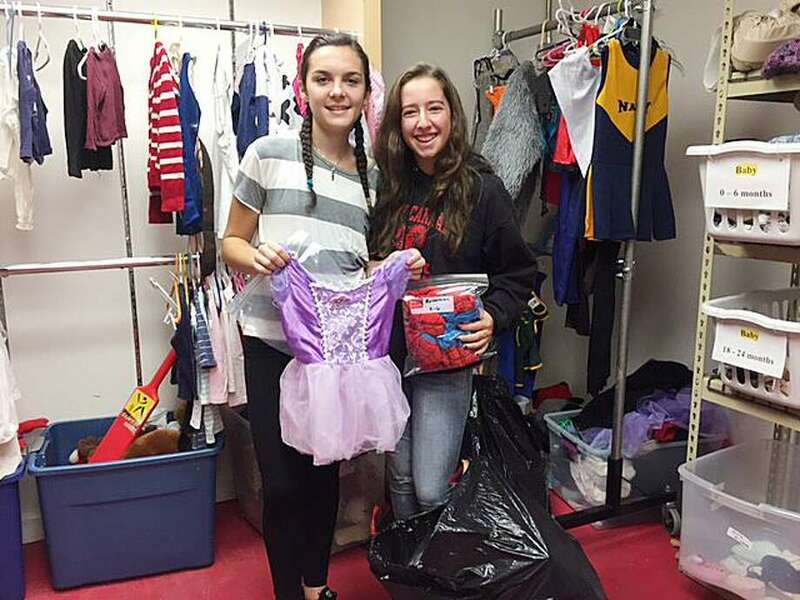 This month, the organization donated over 200 costumes to Person-to-Person in Darien and Hands On Hartford. Combined, these two organizations serve over 30,000 people annually. The costumes were made immediately available to the food and clothing pantries of these organizations. Many of their patrons will be able to dress up as their favorite character this year due to these donations. Recent donations came from Community Costumes’ collaboration with New Canaan Community Preschool, New Canaan Dance Academy and the Holly Pond School in Darien. The preschool’s families have been very supportive of the mission and have donated over 350 costumes during this year’s donation period. Community Costumes is collecting costumes for future donations. Donations of new or gently used Halloween, dance and dress-up costumes may be dropped off at the New Canaan Library (parking lot entrance door) and the New Canaan YMCA. Look for the colorful donation boxes. Dr. Robin Gail Oshman, a Westport/New Canaan board-certified dermatologist in solo private practice, was recently elected vice president of the Connecticut State Medical Society. The organization represents state physicians and is concerned with broad areas of scientific and professional interests. For the past 26 years, Oshman served as the medical director of the annual free skin cancer screenings at the Westport/Weston Health District Center. She is the president of the Women’s Medical Association of Fairfield County and the immediate past president of the Fairfield County Medical Association. Oshman is an active member of the American Academy of Dermatology and the American Society of Dermatological Surgery. Oshman has been practicing medical and cosmetic dermatology and dermatological surgery for 27 years. She performs skin cancer screenings, evaluation of skin conditions, laser hair removal, Botox injections, injecting fillers, removal of face and leg veins and peels. She resides in Westport with her husband. The New Canaan Historical Society’s annual cemetery tour will take place on Nov. 1. The tour is the day after Halloween on All Saints Day, which also coincides this year with Mexico’s Day of the Dead. On Tuesday at 1 p.m., the tour will leave by van from the Historical Society. Patricia Funt Oxman, antique dealer and Historical Society volunteer, and Patricia Brooks, author of “Where the Bodies Are” and two other books about where famous people are buried, will take the group to a cemetery in north Stamford. Oxman will conduct a tour of the small rural burial ground where a number of famous and noteworthy people are buried, including Gilda Radner and Benny Goodman. The tour group will return to the New Canaan Historical Society for a brief talk by Brooks and a snack of doughnuts and cider. For details about the tour, call 203-966-1776. Two New Canaan artists are participating in the Wilson Avenue Loft Artists’ Annual Exhibition. Wilson Avenue Loft Artists, known as WALA, have chosen “A Sense of Place” as the theme for their annual community event — a group exhibition in South Norwalk which opened on Oct. 28 and continues with Open Studios on Oct. 29 and 30 from 11 a.m. to 4 p.m.
Susan Cutler Tremaine creates an expressionistic image of the dining table, while Isadora Machado Lecouna’s self-portraits are like giant postage stamps that tell the story of her long, convoluted path as an immigrant trying to become a U.S. citizen. WALA studios are located at 225 Wilson Ave. in South Norwalk, on the second floor, but the entrance and parking are on Ely Avenue behind the building.